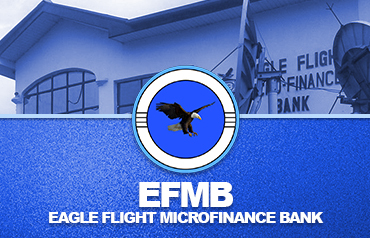 Eagle Flight Micro Finance Bank Limited is one of the first Micro Finance Bank that got approval in this part of the country. It assumed its corporate citizen status when it was duly incorporated on 9th day of October 1992 with registration number 206798 as Isuiwa Community Bank which later transformed into Eagle Flight Community Bank in February 18th, 2005. On 26th December, 2005, like an acorn tree emerged Eagle Flight Micro-Finance Bank Limited in response to the clarion call of visionary Nigerians to support the attainment of the Federal Government Millennium Development Goals (MDG) through the National Economic Empowerment & Development Strategy (NEEDS). The background of this bank stems from the vision of her promoters to empower his community spiritually and economically as a panacea to youth restiveness in the Niger-Delta region in order to create the enableness for economic activities to return to the path of growth in defiance of the economic downturn of Warri occasioned by the ethnic crisis which persisted in Warri and its environs and almost destroyed the fabric of the existence of the Niger-Delta region.